SurveyGold software is a Simple Survey tool for conducting online surveys. Collect responses, and generate real-time reports with email notifications and survey results data analysis with graphs and cross-tabs. Collect surveys via Mobile. Students, Teachers, Non-profit organizations, Small, and Medium companies make use of the software. How much does SurveyGold cost ? The pricing for SurveyGold starts at $15.0 per month. SurveyGold has 3 different plans such as - Standard at $15.0 per month, Premium at $25.0 per month and Ultimate at $300.0 per user per year. SurveyGold offers a Free Plan with limited features. They also offer an Enterprise Plan for their product. The software offers a 30 percent off Any Regular Price for a Monthly or Annual Subscription on basis of request. "Easy way to compose a survey "
Ease of composition of a survey, takes very little time to develop and implement the survey. Results can be downloaded via Excel. .
: Easy to learn and use, took a couple of hours to get surveys up and running. Online web collection very easy, as is paper data entry. Run and design survey, directly download results and analyze them. The ability to delete and add questions to a running survey is extremely helpful. I have been using this software for many years now and have never needed any other software. Pros: Ease of composition of a survey. I can now do quite complicated surveys with jump logic and test them and implement them in a matter of hours. I download the results to Excel and save them on my pc. I do like that I am notified by email when new data is to be downloaded. 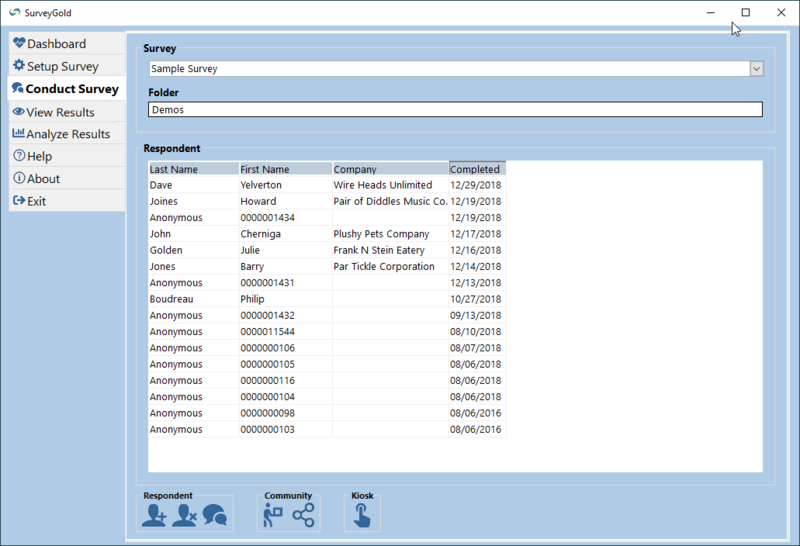 The ability to delete and add questions to a running survey is extremely useful. Also it does not matter how many respondents I have. Also I have never lost any data, even with server and internet crashes. Cons: That I have to pay for it! (Just joking as it is not expensive). There is a free version but that is not useful to me as it only allows ten questions. From a price point of view it is very cost-effective. Overall: It enables us to give very effective results to our users so they can analyse the answers in any way they prefer. 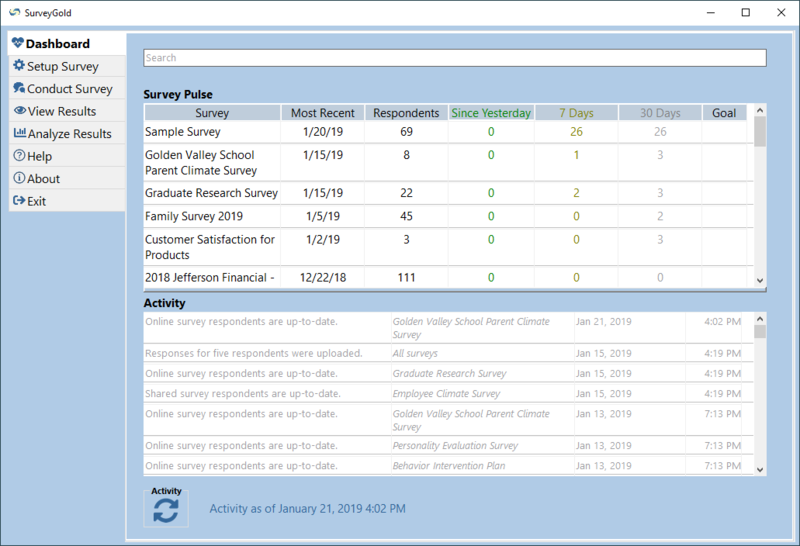 "SurveyGold Uses in a Large Urban School District"
I have used SurveyGold for over a decade in Educational Program Evaluations for both attitudinal surveys and data collection tasks. It is hard to point to its best feature as there are several. 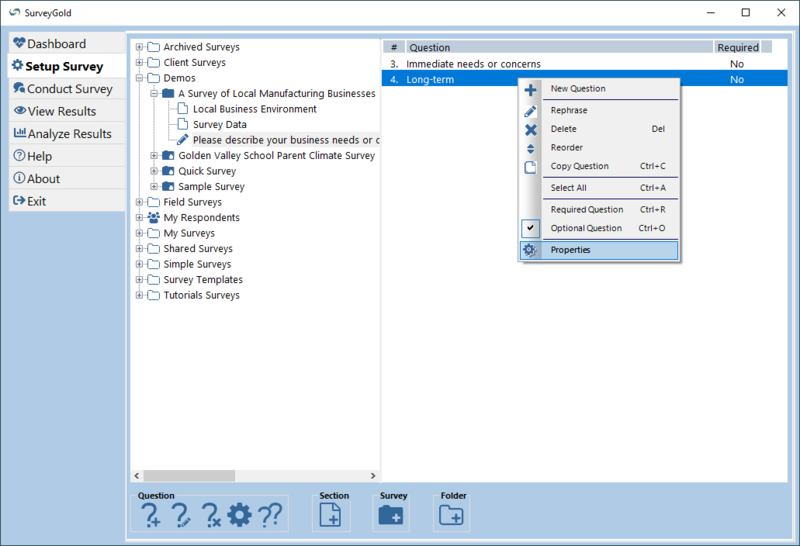 What I like best about SurveyGold is its flexibility and relatively simple framework which still allows complex survey configurations. It also easily converts results to multiple other software (Excel, Word, SPSS etc.). I am also impressed with the security of the cloud based storage of Survey data. In addition technical support is terrific and it is reasonably priced for a large school district. Surveys in a large district often have thousands of respondents and the flat annual rate covers all. Even with the new pricing structure it is an extremely reasonably priced product. I would like to be able to easily use a Bold and Italic font in questions and explanations. You can try the free version to determine your own comfort with it but for anyone who needs to be able to conduct surveys from a large number of respondents with high security SurveyGold is hard to beat. At present I am conducting a survey of 10,000 students for a major program and it is going smoothly. In the past SurveyGold has provided an excellent data collection solution enabling gathering information from hundreds of school sites. SurveyGold has provided a ready made platform for this activity at no additional cost. "Used as a training registration and evaluation product." The product is easy to use and reliable. The way the product converts survey results to the spreadsheet. Comments: Easy to learn and use, took a couple of hours to get surveys up and running. Used for 3 years on around 1000 surveys. Online web collection very easy, as is paper data entry. Shows custom page on 'submit' which allows me to get respondents to a thank you page on my web site. 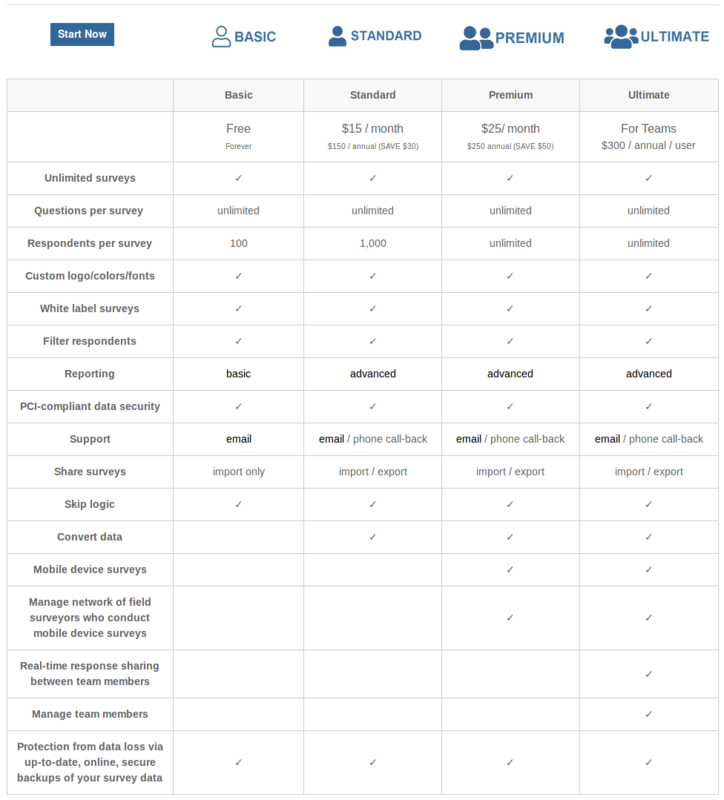 Good reporting and data export to various (I use excel, but all the obvious ones are there). Backup to the cloud saved me and worked a treat the one terrifying time I had to rely on it to restore after computer failure. You can back up to local hard disk also. Nice features and a very good price, customer service responses via email are also very good and usually within a day (1 day may be time difference between me in Europe and them in America, I have only emailed them in the middle of their night). Really good software that I have used for 3 years, on around 1000 surveys, and I can highly recommend.